Born: February 26, 1858 in Falmouth Ma. Died: April 16, 1936 in Bourne Ma. at 79 yrs, 1 mo, 20 d.
1. Harrie Bion Landers; (October 20, 1890 – November 29, 1975); Married (1) Elsie Martha Fuller (1889 – 1919) (Thomas Andrew Fuller & Lena Fortia Dimmick) in Wilsall Mt. on February 14, 1915 & married (2) Mabel (Moyle) Lounsbery (1898 – 1968) (Solomon Moyle & Hadesseh Bickey) in Harlowton Mt. on April 3, 1926; Mabel married (1) Alonzo William Lounsbery (1893 – ?) (Andrew J. Lounsbery & Ida Kennison) in Butte Mt. on October 11, 1919; Harrie was born in Ilwaco Wa. ; He & Elsie had two children born in Wilsall Mt. ; Harrie Bion & Mabel are buried in Mountain View Cemetery in Livingston Mt. ; Elsie & her 2 sons, Harrie Fuller Landers & Thomas Bion Landers, are buried in Cataumet Cemetery. 2. Asenath H. Landers; (February 1892 – ? ); Asenath was born in Washington. 3. 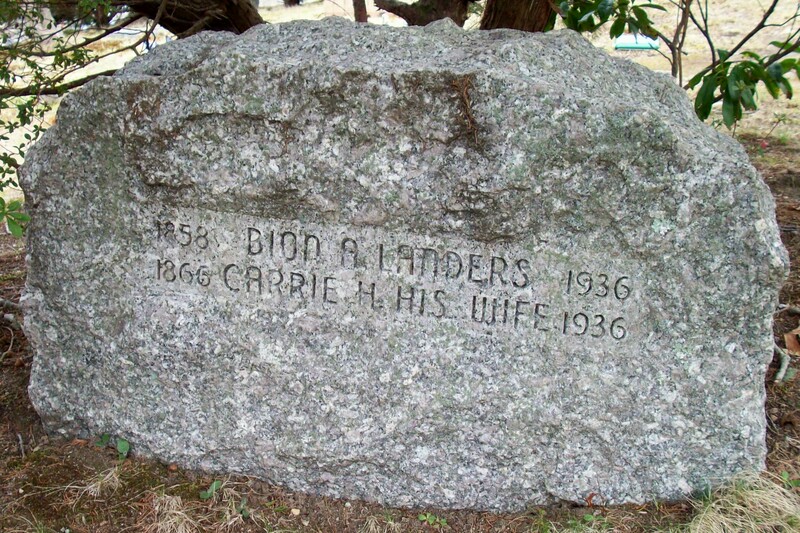 Giles Ezra Landers, WW l; (November 16, 1893 – February 22, 1964); Married Fanny Gertrude Perry (1891 – 1966) (Daniel Webster Perry & Emma A. Cook) in Nashua N.H. on September 20, 1919; Giles & Fanny are buried in Cataumet Cemetery. 4. Herbert Isaac Landers; (July 3, 1895 – October 7, 1976); Married Maria A. Natteford (Bernard T. Natteford & Henrietta M. (–)) in Bourne Ma. on June 10, 1933; Herbert was born in Ilwaco Wa. ; Herbert & Maria were in the U.S.Army & both are buried in the Massachusetts National Cemetery in Bourne Ma..
5. Belvin Hennes Landers; (March 30, 1905 – March 7, 1977); Married Emma H. Hern (1904 – 1977) (Thomas C. Hern & Harriet E. Holbrook) in Bourne Ma. on September 15, 1939; Belvin & Emma are buried in Cataumet Cemetery.